A firm believer in the need for all children but especially Girls to get educated, Los Angeles/ Nigerian native Zuriel Oduwole has expanded her skill transfer program, this time to children from the low income Ibeju - Lekki area of Lagos State and kids from the Makoko slum area of Lagos mainland. 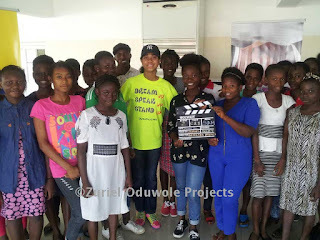 Earlier in June in parts of Abuja, she spent it teaching children elements of her Film Making '101' program, as part of her DUSUSU Foundation's efforts to reduce the number of out of school and non skilled youths in the country. Wow...........wow...wow.wow....did I read that she is 13....like 12+1=13...?? ?/What have I don't with my life...im too embarrassed to even say how old I am. BLACK GIRLS ROCK !!!!!!!!!!!! !